The Nissan X-Trail has always been known for its sculpted and muscular styling, with chiselled lines, high wheel arches and elegant curves on the bonnet. All of those characteristics remain, and are now showcased through a distinctive and robust redesign of the front end, adding a new dynamism and more premium styling cues. At its heart is Nissan’s latest ‘V-motion’ grille, wider than before for a more impactful appearance on the road and echoed in the design of the bumper beneath. The redesign makes much greater use of the X-Trail’s body colour, with the visible black plastic benefiting from a smart new gloss black finish. Generation 5(2017 - Present): This latest facelift offers significant enhancements. The front end has got a more modern look through a pair of brand new headlights, bigger grille, new bumpers, bonnet and foglights This generation X-Trail also integrates new technology inside the vehicle featuring such items as the Intelligent Cruise Control. The Nissan X-Trail is available in two different 'grades' starting with the N-Connecta and upgrading to the top Tekna grade. It's never been easier to finance a Nissan with Chorley Group. All vehicles can be purchased outright at our current Cash Price offer, however an overwhelming majority opt to finance new cars with a finance agreement, paying monthly for the vehicle over an agreed period. These finance agreements come in a variety of flavours to suit your personal requirements. Explore our range of New Nissan vehicles online, if you find a vehicle you like you can contact us in a variety of ways. Either through our LiveChat, Online Enquiry Form, Social Media (Facebook, Twitter, Instagram etc), phone or just visit your local Chorley Group. We would also advise a customer to take a car on a test drive before beginning the car buying process. Test drives can be arranged with a member of our Sales Team either online or in person. You will need a full, valid UK driving licence to take a car on a test drive. If you already own an older vehicle and plan to upgrade to one of our newer cars, you can trade and use it toward the cost of your new car. How much is your car worth? We offer a free online Valuation Tool which allows you to get a rough estimate value your car might be worth. All our new cars are available to buy outright, however the majority of customers will take out one of various finance deals and spread the costs of the car over series of monthly payments. Finance offers allow you to select your own annual mileage, grade preference, colour and terms. All new Nissan cars come with a pan-European Warranty, for each new vehicle registered and operated in European countries where authorised Nissan dealers are located. Within the period of time or mileage specified, we will repair or replace, free of charge, those parts or components which are covered by the section's description and which may prove defective. Learn more about our Warranty options by visiting our contacting our Service department. Expect more with Nissan Intelligent Mobility. Nissan Intelligent Mobility is the name for the brand’s advanced technologies which make its cars more desirable by redefining how they are driven, powered and integrated into society. The goal is to make Nissan drivers feel more confident, excited and connected, while also enhancing road safety. Turn by turn directions is here. They're simple directions on the instrument to help make your journeys safer and more relaxing knowing you'll make it from A to B stress free! 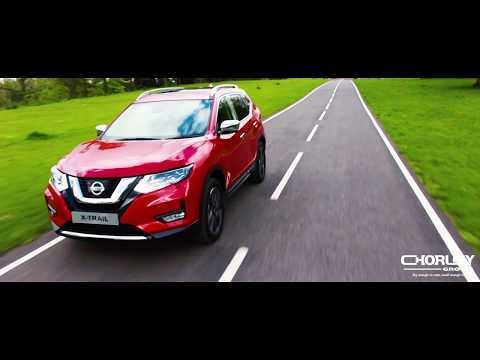 NissanConnect EVO, help make your smart device your X-Trail's friendlies companion and allow access to music and navigation on the go, not forgetting to check your Facebook newsfeed, when parked of course! Maintain your ideal climate inside the vehicle with the independent temperature controls for the left & right side of the vehicle to allow both yourself, and your passengers to adjust the level of their comfort for those long drives. The X-Trails cargo space is instantly adjustable to allow you to pack all those essentials items for those long journeys with 565 L, seats up, and 1,996 L with the seats down. Turn up the music with the premium sounding BOSE Audio System bringing immersive sound to every passenger, wherever they're sat.